Maxillary sinus elevation is a widely used and relatively safe and predictable technique. Frequently, when aberrant anatomical conditions of the sinus are present, the handling of such a procedure might become more complex, and subjected to possible intra- and post-operatory complications. One of the most challenging anatomical conditions to manage is the alveolar antral artery (AAA), when it is unusually wide in diameter and passes through the area of the osteotomy with a complete intraosseous course. In the literature, many treatment options have been proposed for the surgical management of such an anatomical condition. The aim of this case report is to describe the clinical handling of an AAA with a piezosurgical approach, including the artery in the bony window design, but avoiding its displacement and possible tearing that might cause severe intra-operatory bleeding and post-operatory complications. Misch CE. 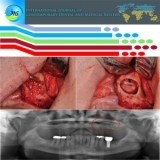 Maxillary sinus augmentation for endosteal implants: Organized alternative treatment plans. Int J Oral Implantol 1987;4:49-58. Flanagan D. Arterial supply of maxillary sinus and potential for bleeding complication during lateral approach sinus elevation. Implant Dent 2005;14:336-8. Van den Bergh JP, Ten Bruggenkate CM, Disch FJ, Tuinzing DB. Anatomical aspects of sinus floor elevations. Clin Oral Implants Res 2000;11:256-65. Solar P, Geyerhofer U, Traxler H, Windisch A, Ulm C, Watzek G. Blood supply to the maxillary sinus relevant to sinus floor elevation procedures. Clin Oral Implants Res 1999;10:34-44. Traxler H, Windisch A, Geyerhofer U, Surd R, Solar P, Firbas W. Arterial blood supply of the maxillary sinus. Clin Anat 1999;12:417-21. Strong C. The innervation and vascular supply of the antrum: (Section of laryngology). Proc R Soc Med 1934;27:745-51. Rosano G, Taschieri S, Gaudy JF, Weinstein T, Del Fabbro M. Maxillary sinus vascular anatomy and its relation to sinus lift surgery. Clin Oral Implants Res 2011;22:711-5. Chanavaz M. Sinus grafting related to implantology. Statistical analysis of 15 years of surgical experience (1979-1994). J Oral Implantol 1996;22:119-30. Ella B, Sédarat C, Noble Rda C, Normand E, Lauverjat Y, Siberchicot F, et al. Vascular connections of the lateral wall of the sinus: Surgical effect in sinus augmentation. Int J Oral Maxillofac Implants 2008;23:1047-52. Maridati P, Stoffella E, Speroni S, Cicciu M, Maiorana C. Alveolar antral artery isolation during sinus lift procedure with the double window technique. Open Dent J 2014;8:95-103. Almaghrabi BA, Hatton MN, Andreana S, Hoeplinger MA. Treatment of severe sinus infection after sinus lift procedure: A case report. Implant Dent 2011;20:430-3. Kutkut AM, Andreana S, Kim HL, Monaco E. Clinical recommendation for treatment planning of sinus augmentation procedures by using presurgical CAT scan images: A preliminary report. Implant Dent 2011;20:413-7. Valente NA, Raffaelli L, Manicone PF, D’Addona A. Influence of the piezosurgery in the intra and post-operative course: Preliminary results. Dent Cadmos 2010;78:79-88. Hur MS, Kim JK, Hu KS, Bae HE, Park HS, Kim HJ. Clinical implications of the topography and distribution of the posterior superior alveolar artery. J Craniofac Surg 2009;20:551-4. Kim JH, Ryu JS, Kim KD, Hwang SH, Moon HS. A radiographic study of the posterior superior alveolar artery. Implant Dent 2011;20:306-10. Güncü GN, Yildirim YD, Wang HL, Tözüm TF. Location of posterior superior alveolar artery and evaluation of maxillary sinus anatomy with computerized tomography: A clinical study. Clin Oral Implants Res 2011;22:1164-7. Kang SJ, Shin SI, Herr Y, Kwon YH, Kim GT, Chung JH. Anatomical structures in the maxillary sinus related to lateral sinus elevation: A cone beam computed tomographic analysis. Clin Oral Implants Res 2013;24 Suppl A100:75-81. Ilgüy D, Ilgüy M, Dolekoglu S, Fisekcioglu E. Evaluation of the posterior superior alveolar artery and the maxillary sinus with CBCT. Braz Oral Res 2013;27:431-7. Apostolakis D, Bissoon AK. Radiographic evaluation of the superior alveolar canal: Measurements of its diameter and of its position in relation to the maxillary sinus floor: A cone beam computerized tomography study. Clin Oral Implants Res 2014;25:553-9. Watanabe T, Shiota M, Gao S, Imakita C, Tachikawa N, Kasugai S. Verification of posterior superior alveolar artery distribution in lateral wall of maxillary sinus by location and defect pattern. Quintessence Int 2014;45:673-8. Park WH, Choi SY, Kim CS. Study on the position of the posterior superior alveolar artery in relation to the performance of the maxillary sinus bone graft procedure in a Korean population. J Korean Assoc Oral Maxillofac Surg 2012;38:71-7. Rysz M, Ciszek B, Rogowska M, Krajewski R. Arteries of the anterior wall of the maxilla in sinus lift surgery. Int J Oral Maxillofac Surg 2014;43:1127-30.